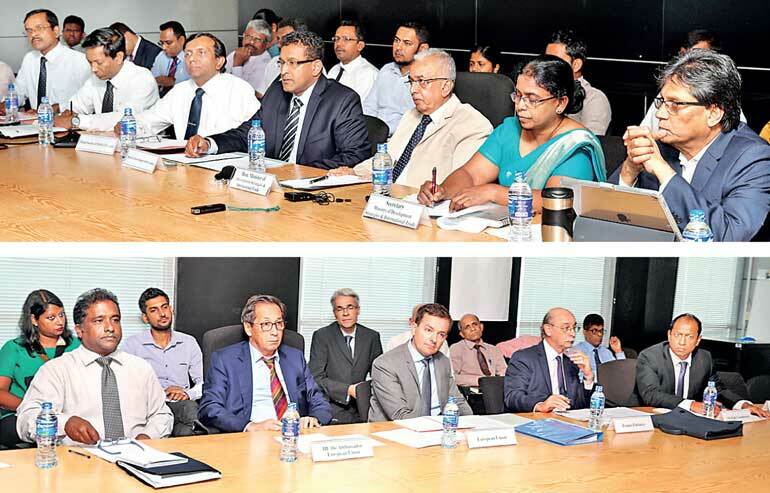 The sixth EU-SL Investor Dialogue was held at the Ministry of Development Strategies and International Trade on 23 February. The meeting was co-chaired by Development Strategies and International Trade Minister Malik Samarawickrama and Ambassador of the European Union to Sri Lanka, Tun Lai Margue. The meeting was held with the Embassy of the European Union, the embassies of the member states of the European Union and the Board of Investment of Sri Lanka to address various outstanding matters relating to investment in Sri Lanka and the European Union. The participants from the European missions represented France, Germany, Italy, the Netherlands, Romania and the United Kingdom. There were also senior officials from European Union missions based in Colombo and New Delhi and representatives of the European Chamber of Commerce. Several leading government agencies participated in the meeting to contribute to the dialogue in relation to specific areas under their jurisdiction. The Sri Lankan state institutions present were the Ministry of Digital Infrastructure and Telecommunications, Ministry of Health, Nutrition and Indigenous Medicine, Ministry of Ports and Shipping, Department of Public Finance, Department of Trade and Investment Policy, Department of Commerce, Department of Fiscal Policy, Information and Communication Technology Agency, Sri Lanka Customs, Sri Lanka Ports Authority, Sri Lanka Tourism Development Authority, Civil Aviation Authority, Department of Inland Revenue, National Medicinal Regulatory Authority, Merchant Shipping Secretariat, Department of Excise and Department of Import and Export Control. The issues in questions included the need for transparent tender procedures and the possibility to build up a central portal where a planned project could be listed. The Cabinet has approved Electronic Government Procurement (e-GP) in the Public Procurement System and it is now necessary to establish the system required for implementation. EU member countries were keen on the effective use of digital signatures and promotion of a paperless concept in order to reduce red tape, delay and duplication of work. It was reported that by now the Department of Customs, banks and the Ministry of Finance have adopted the use of digital signatures. Several matters specific to Sri Lankan companies as well as companies of EU member countries were discussed in order for solutions to be worked out. The levying of charges on Sri Lankan importers and exporters for local charges were also discussed and the dialogue was a good platform to discuss certain local safety and health regulations imposed for food products with the participation of the relevant regulatory agencies.